With a number of technical oscillators on weekly charts bearishly positioned, the Reuters/Jefferies CRB Total Return Index continued to slip last week, extending a decline that originated in late February. Natural gas prices have led the path lower and have proved to be the weakest. Despite oversold conditions and a reduction in drilling rigs from 886 a year ago to 647 now, some observers predict that sub $2 prices will arrive soon. In contrast, gasoline prices have increased steadily and are now at uncomfortable levels. Nevertheless, the notion of rising commodity prices has been waning in recent weeks due to diminished expectations for another round of quantitative easing (QE). In turn, this has resulted in lower precious metal prices as well as lower prices of copper, nickel and aluminum. A number of grain charts, including soybean, wheat and corn, also suggest that a correction to lower levels appears likely over the months just ahead. Friday’s weaker-than-expected employment data, however, could revive the idea that QE is not entirely off the table. Increased signs of a more pronounced decline in global growth (particularly in the Euro zone and China) might also raise the prospect of more QE in the months just ahead. 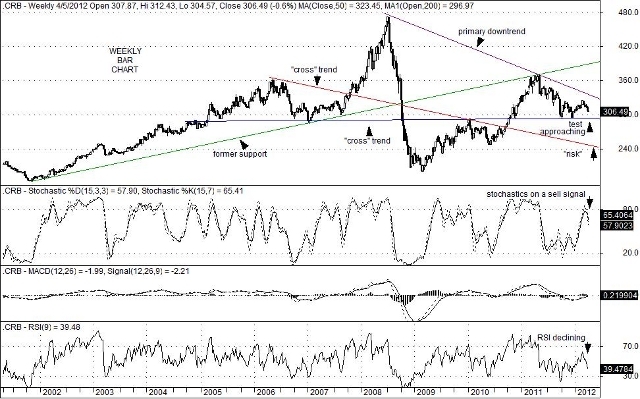 For now, the Reuters/Jefferies CRB Total Return Index appears to be aimed for a test of key “cross” trend line support located at the 293.50 level. If that level fails to hold as support, however, the worry would be that a solid extension to the downside could result. While troublesome for commodity producers and farmers, such a break would be very positive news for consumers as well as for companies who are large commodity users. That being said, it is worth keeping a sharp eye on the 293.50 level. With stochastic studies rising positively on long-term (monthly) charts, it appears that the Dow Jones Transportation Average may be aimed for a test of key “channel top” resistance that currently sits at the 5,675 level. 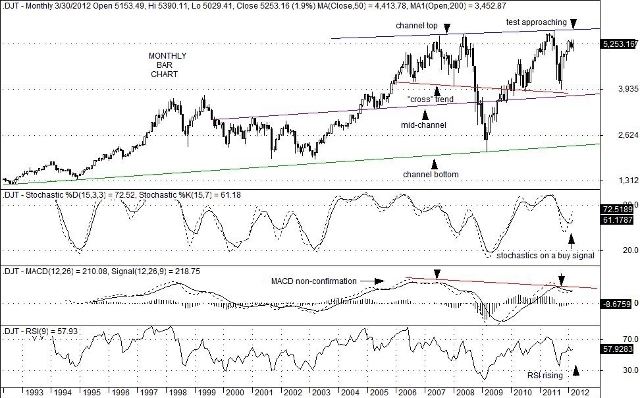 While the absence of an overbought condition on monthly charts is supportive of higher levels, a bearish technical divergence in the form of a Moving Average Convergence and Divergence (MACD) non-confirmation signal is present as well. A “non-confirmation” signal occurs when the price of a security or an index achieves a new high, but the corresponding MACD oscillator does not. Such a condition suggests that bullish price “momentum” is on the wane which, in turn, is considered to be a big yellow flag of caution. Another area of concern is that the pattern of the Dow Jones Transportation Average for the past three years resembles one that occurred between 2005 and 2008. In that case, one could argue that a bearish Head & Shoulders pattern had formed albeit with its “right shoulder” equaling the height of the “head”. But there’s the rub, because the current set-up suggests that the likelihood of a “channel top” test is reasonably good and a possible and similar “head & Shoulders” pattern could once again occur. If this transportation index fails to break above channel resistance again, a good deal of investor consternation might well emerge. Rising transportation costs, weaker demand for raw materials fromChina, or the approach of a possible “fiscal cliff” after this year’s Presidential election is resolved could each contribute to a slowdown in transportation activity heading into 2013. Renewed worries over European debt issues could reemerge as a threat as well. All of these concerns should cause Dow Theorists to pay heed to the outcome of the expected “channel top” test. Those observers need to see the Dow Jones Transportation Average rise and confirm gains scored by the Dow Jones Industrial Average in order to boost confidence that the economy is on sure footing. You are currently browsing the Charted Territories blog archives for April, 2012.